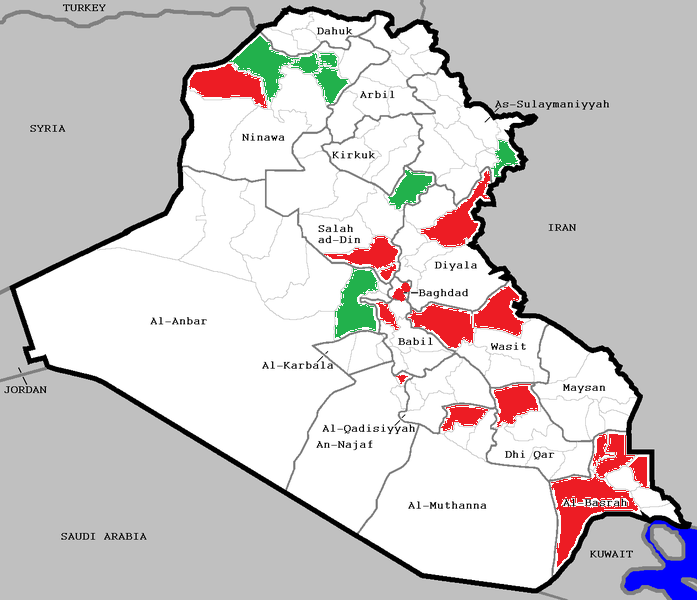 Iraqi districts that have been slated for governorate status (green) and districts that demand governorate status (red). The recent announcement by the Iraqi cabinet that a number of existing district (qada) administrative units will be upgraded to governorate status (muhafaza) has prompted intense discussions across Iraq. As of today, beyond what the cabinet has announced, around 17 additional districts have in various ways been promoted as candidates for governorate status. The lists that follows is supposed to be up to date as of the time of writing, but this is clearly a moving target, with the situation quite literally changing by the hour. Nonetheless, it can be assumed that the most eager candidates for governorate status have made their voices heard by now. Also, to some extent, there are a few common characteristics between these would-be governorates that seem to explain their candidacies. In particular, in many cases, they form the second most populous area of their current governorate, but not the seat of the provincial government. Furthermore, distinctive minority populations are important in some areas (Yazidi in Sinjar, Shia Arab in Balad and Dujayl, Kurdish in Khanaqin). Some of the districts involved stand out for their natural resources (Qurna and Zubayr in Basra). Generally speaking, it is worth noticing that whereas the new governorates proposed by the cabinet were mainly Shiite minority and other minority areas in the north that are scheduled to be separated from mainly Sunni Arab majority governorates, most of these “bottom-up” demands for governorate status are Shiites wishing to separate from Shiite majority governorates (Dujayl and Balad in Salahaddin being the exception, but Shiite politicians have been talking about plans for the attachment of these to Baghdad at least since 2011). Methodological problems aside, it is noteworthy that according to population estimates from 2003, most of these districts have smaller populations than the districts recently upgraded to governorate status by the cabinet: Tell Afar was estimated at 301,000; the Nineveh plains governorate formed by the 3 districts of Hamdaniya, Tell Kayf and Shaykhan at around 392,000; Falluja at 426,000. The exception is Tuz Khurmato, estimated at only 153,000 in 2003. There aren’t that many districts that had more than 300,000 inhabitants in 2003 without at the same time being the provincial seat of government – Shatra in Dhi Qar is the main exception at around 315,000. Simultaneously, some more news about the thinking of the Iraqi government on the issue of new governorates has emerged. Regarding Baghdad, the legal adviser of Prime Minister Nuri al-Maliki has made the claim that the city is indivisible because of the capital status enshrined in the Iraqi constitution with reference to its governorate borders (article 124). More generally, in a statement to the press, an inspector general of the ministry for municipalities and public works says that the legal procedure for creating new government is modelled on the old governorate law no 159 from 1969, but then goes on to (rightly) admit that the old law has been replaced by a new law (of 2008, which does not provide any particular framework for such changes). Nonetheless, the inspector general seems to think there are specific criteria that govern the selection of candidates for upgrade to governorate status, including population size, existing institutions of government and distance from the existing provincial centres. He goes on to mention difficulties of investment in places like Halabja and Tal Afar which he attributes to the crimes of the Baath regime and more recent terrorist activity. All in all, frankly, this does not serve as a legal clarification. Of course, in theory, the Iraqi government can introduce a bill on just about any subject under the sun, but in a modern democracy it is expected that matters such as administrative jurisdictions are governed by a uniform legal framework. In any case, maybe the multiplication of demands for governorate status was to be expected. Maybe the Iraqi cabinet had calculated this would happen, and that the impracticality of admitting all these candidates – and especially the inevitable debate about the capacity of governance related to such wide-ranging transformations – would kill off the whole idea of changing Iraq’s administrative map in its infancy. The only thing that is certain is that none of these plans will come into existence before the 30 April parliament elections, meaning that much of the debate relating to it must be studied in relationship to those elections first and foremost. This entry was posted on Tuesday, 4 February 2014 6:30 at 06:30	and is filed under Basra and southern regionalism, Iraq - regionalism - general. You can follow any responses to this entry through the RSS 2.0 feed. Both comments and pings are currently closed.